Infants and toddlers are beautiful observers and experience the world so lovingly with all of their newly discovered senses. As caregivers, we honor the way in which these precious ones experience their world as well as each baby’s own unique internal clock and rhythm. We hold and wear babies as often as possible, limiting any loud noises and music from artificial sources. We sing to these little ones, talk with them, listen to them, dance with them, cuddle them and offer them natural materials such as silk, wood, organic cloth toys and toys from nature. After morning drop-off, each of our friends are worn and then transitioned onto their lambskin rugs to explore, observe, and interact with other friends. Crawlers have the space and time to adventure and discover before being invited to morning snack followed by yoga, story or song circle. Our toddler friends enjoy morning circle where we sing and learn about what the day will entail. Either rain or shine we go outside to explore Mother Earth's offerings at nearby parks or on nature walks, collecting treasures for our nature table. While in our own home space, we plant or tend to our garden and notice what changes the season has brought. After thanking the loving Mother Earth for our lunchtime meal we enjoy eye contact, conversation and song before settling down to afternoon nap. After some post-nap cuddles and stories, our friends are offered snacks and time to play and explore. Perhaps we can sneak in one last visit to the garden before starting the gentle preparations for the end of our day, the return of loving caregivers, and the sweet evening that is about to greet our friends. 12:00 pm Wash hands for mid deal meal. Some days we make our own flubber or play dough, create puppets for a puppet show, paint, bake, or visit our local library for story time. Once a week, we enjoy visits from our music and Spanish teachers. 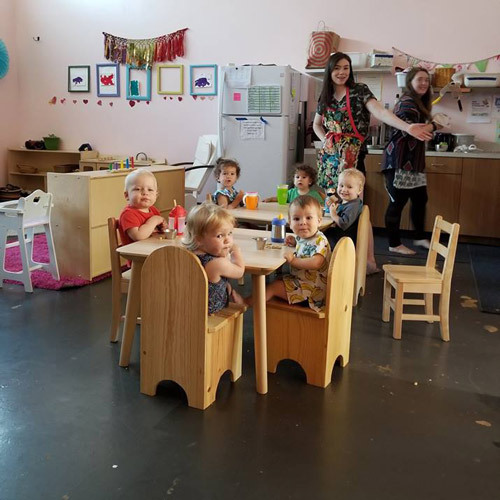 Occasionally our toddler group adventures on the city bus for a field trip that might include visiting a pottery painting studio, touring a nearby fire station, exploring a local farm or other exciting spot where we learn and create in community.